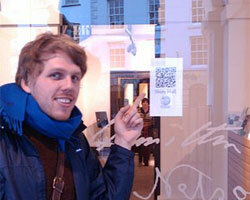 QR codes have been placed all over Monmouth, Wales that link directly to Wikipedia pages. Toss out the travel guide and grab your smartphone — a new urban project has transformed a small town in Wales into the world’s first Wikipedia town. The project, called Monmouthpedia, links the sights and scenes within the nearly millennium-old town of Monmouth, the birthplace of King Henry V, to Wikipedia pages written by volunteers across the world. How do Monmouth’s physical locations and web pages connect together? Through posted QRpedia codes, which are scannable QR codes that pull up Wikipedia content in the smartphone’s set language. On the surface, this may not seem like that big of a deal, until you consider the scale of the effort involved: the project aims to produce over 1,000 Wikipedia pages (there are around 600 new articles at the moment) about every notable person, place, and artifact in Monmouth for tourists in as many languages as possible, which is currently around 30 but can potentially build to over 250 languages. That’s a quarter of a million Wikipedia pages for a town populated by less than 10,000 people. The Monmouthpedia project was started by John Cummings, who got the idea after watching a TEDxBristol presentation on the use of QRpedia codes at the Derby Museum and Art Gallery. The idea took six months to develop and involved a variety of partnerships, both physical and virtual. The technological support for the project was provided by the Monmouthshire County Council, which is installing Wi-Fi across town for users to access the Internet for free, and Wikimedia itself contributed $40,000 to the project, according to the LA Times. Along with over 1,000 images of Monmouth added to the project, the articles keep pouring in as volunteer content contributors keep generating content, translating pages, and continually improving upon what’s been produced. That includes geotag information to allow visitors to take virtual tours using the QRpedia codes. QRpedia solves a longstanding problem in tourism: providing relevant information that’s easily accessible. That’s why travel, museum, or even restaurant guides are catalogs of massive information organized around easily indexable subjects. This is what also makes them big, bulky tomes to have to carry while trying to sightsee. But QRpedia codes mean that travelers don’t have to carry a book, the search process is as simple as holding a phone up to a code of interest, and information is accessible one web page at a time. This gives enormous control over how deep someone wants to learn about a subject of interest. And QR codes are relatively inconspicuous. But Monmouthpedia is only the beginning for what is possible for augmented reality-aided tourism. See, QR codes are still a pull technology, meaning the user still has to find the code and scan it with a phone. Sure, a QR code takes less time to scan than trying to do a Google search on-site, but a much easier way would be to have location-aware technology that could push information at you, according to your preferences. This could be accomplished using RFID chips, near field communication or the next generation of GPS smartphones that will pinpoint your location down to the inch. So if you stood in the proximity of a famous building for more than 10 seconds, the Wikipedia page about the building would open on your smartphone automatically. Behind the smartphone, there’s all the hope and hype of Google Glass, which could not only use GPS, but possibly photo recognition, especially for identifying faces. Regardless of whether future tourism projects use QR codes or another technology, the need for Wikipedia content, and lots of it, will remain. So the Monmouthpedia project isn’t so much about the current technology being used, but a recognition that the barrier between the physical and virtual worlds is crumbling. Additionally, it showcases how people across the world can rally around a historical location, even one that may not be a household name, to generate and foster real community connections using technology.